A recent string of blustery, grey days abruptly ended our streak of glorious fall weather, and the pounding of the rain on the window panes sent me scuttling to the kitchen in search of warmth and comfort. 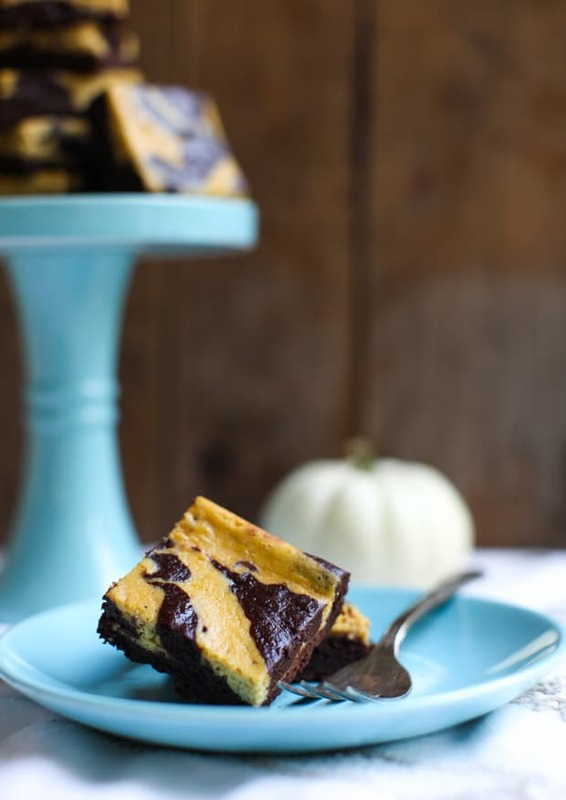 I found solace in a pan of marbled, maple-sweetened pumpkin cheesecake brownies, rich with both chopped chocolate and dark cocoa and lightly spiced with the beloved autumn flavour of my own ‘pumpkin spice’ blend. 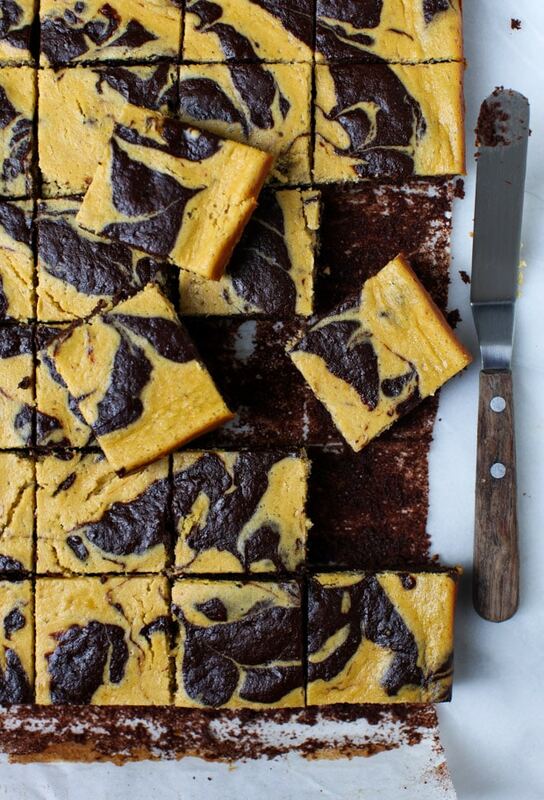 If these brownies sound like an irresistible fall dessert, you are absolutely right. They are soft and dense, moist and rich – but what really makes them ideal is that they also contain a secret nutritious ingredient. 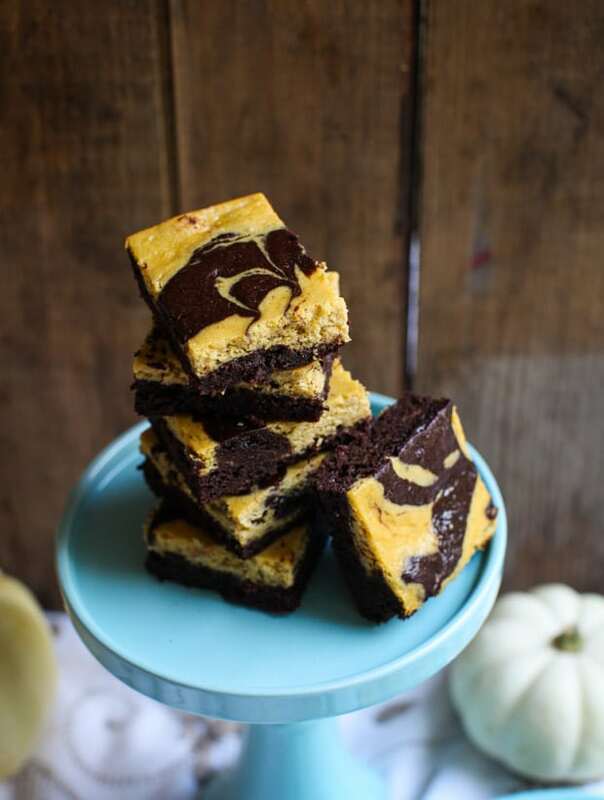 Instead of all-purpose flour with its empty calories, I use a scoop of whole navy bean flour in these Spiced Pumpkin Cheesecake Brownies and the final result is every bit as scrumptious. I use a product from Best, a Canadian company out in Lentil Country (aka the Prairies), and their whole navy bean flour can be swapped out cup-for-cup for all-purpose flour in cookies and brownies. Not only does this substitution make for a gluten-free treat, but pulse flour is very high in fibre and we could all use more fibre in our diets. Why? On average, men need 38 grams of fibre per day and women need 25 grams per day. Yet studies show that the average adult only eats 15 grams of fibre per day. Holiday baking is best time to add something nutritious to the mix. I mean, we’ve got cookie swaps to host and teacher’s gift to bake, pot-lucks to attend and gatherings to host. I see a lot of sweets coming to the table over the next few months, so why not bake up a brownie with a little extra protein, fibre, iron and micronutrients? If you’re curious about baking with more pulse flours, definitely check out the Desserts section over on PulsePledge.com. Especially the chocolate chip cookies with chickpea flour and the lemon pound cake. Oh! And chickpea gingersnaps. If you’re down with it, go ahead and take the pulse pledge. I’ve been keeping up with my Pulse Pledge to eat lentils, chickpeas, beans and peas at least once a week in 2016. I’ve incorporated lentils into everything from breakfast to biscuits, and now, brownies. 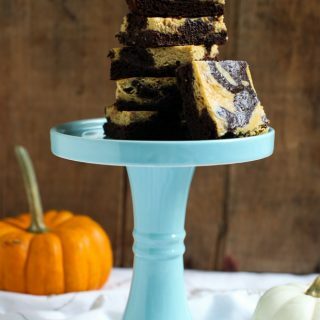 I tested these Spiced Pumpkin Cheesecake Brownies many, many times. It turns out creating a swirled brownie is really hard! During the development process, I sent brownies to Danny’s work and to church functions. I brought a pan to Thanksgiving dinner at the in-laws, and froze another pan for emergencies. So. Many. Brownies. But the final result ended up so perfect; truly everything a brownie should be – and more, thanks to the extra fibre. 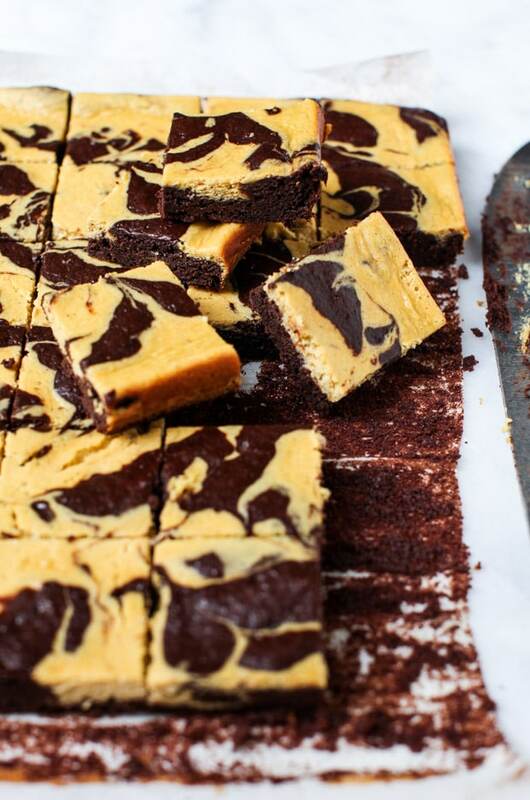 Now are these brownies you can feel good about eating? Absolutely. Are they ‘healthy’ and should you binge on three or more squares? No and NO. But you can still take some comfort in the fact you are eating a sustainable, protein-packed treat that is absolutely delicious. Here’s a bit of real talk about this recipe that you should know before you jump up and preheat the oven. For starters, it dirties a lot of dishes. It just does. It has all these different components that make up the glorious result: the cheesecake, the dry ingredients, the wet ingredients and the luscious melted butter and chocolate blend. Just do what I do and enlist a dishwasher with the promise of payment in brownies. You’ll have back-up, I promise. Hey, if you are looking for a vegan brownie, try my Pumpkin Seed Cocoa Brownies, another favourite! 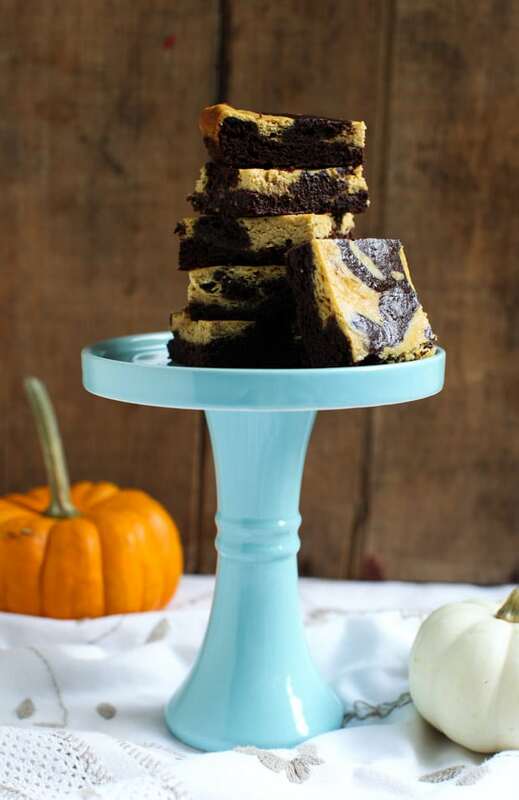 These pretty brownies are an irresistible fall dessert - soft and dense, moist and rich. Have all ingredients at room temperature (except the boiling water - duh). Preheat an oven to 350F and place the rack in the centre of the oven. Butter a 9x13 baking pan and line with parchment paper. Butter the parchment. In the bowl of a stand mixer fitted with a paddle attachment, combine cream cheese and maple syrup. Beat on high until creamy with no lumps, stopping the mixer from time to time to scrape down the sides. About 2 minutes. Add 3 Tablespoons of pumpkin puree, 1 teaspoon vanilla,1/4 teaspoon spice blend and a pinch of salt. Beat well to combine into a smooth mixture. Separate one egg, discarding the white or reserving for another use, and add the yolk to the cream cheese mixture. Crack in one more egg. To be very clear, you are adding 1 whole egg and 1 yolk to the mixer bowl. Mix on medium until just combined. Scrape down the sides, then place the bowl in the refrigerator to chill while you prepare the remainder of the recipe. Add the bean flour to a medium mixing bowl. Sift in the cocoa powder, baking powder, baking soda, remaining salt and 1 teaspoon pumpkin spice blend. Whisk to combine, then set aside. In another medium mixing bowl, whisk together the remaining egg with the oil. Add the sugar and beat for 1 minute. Add remaining 1/2 cup pumpkin puree and vanilla; mix to combine. In a microwaveable bowl or measuring cup, melt butter on HIGH for 25-30 seconds or until melted and very hot. Scrape chopped chocolate into the butter and stir gently with a spatula until the chocolate is melted. Add the melted chocolate to the bowl with the sugar mixture and fold gently with a spatula to combine. Tip in all of the flour mixture and fold together. Splash in the buttermilk and mix to combine. Lastly, pour in the boiling water and mix until smooth. Immediately, spread about 2/3 of the brownie batter around the prepared baking pan. Grab the cheesecake mixture from the refrigerator and pour it all over the brownie batter. Dot with remaining brownie batter, then quickly run a toothpick or the blade of a knife through the whole pan to swirl the two batters together. Place the pan on the centre rack and bake for 27-30 minutes or until the centre of the brownies only *slightly* jiggles when you shake the pan. Try to rotate the pan 180 degrees once halfway through the baking. Cool brownie pan completely on a wire rack, then transfer to the refrigerator to chill before cutting. To cut, remove the chilled brownies from the pan by lifting the parchment paper. Run a chef's knife under hot running water to warm it, and then make quick, firm cuts into the brownies. Store brownies in an airtight container, refrigerated for up to 5 days. To freeze: wrap the pan well in plastic and freeze for up to 3 months. Traditional Pumpkin Pie Spice may be substituted for my homemade Pumpkin Spice Blend. All-purpose flour or gluten-free flour blends may be substituted for the navy bean flour. It’s a great flavour pairing for sure. Enjoy! I’ve never thought to use bean flour before! A healthy way to incorporate more protein for sure! These brownies look spectacular! All the dirty dishes were worth this yummy looking result, and your swirls are perfect! I’m really interested in using pulse flours. I like the idea of cup for cup swapping so there’s no guess work. Thanks for posting! Thank you for the kind words, Colleen – swirls are hard to do!! 🙂 I hope you check out pulse flours; it’s pretty amazing what they can do. Oh I”m thrilled! Glad you are giving them one day to really chill and firm up. I slice them cold, but then bring them up to room temperature to serve. 🙂 Happy baking! First of all, these are GORGEOUS. I love the colours, and the swirling is perfect. So great job there. Second, the flavours sound really, REALLY good. I’m a big pumpkin cheesecake fan, and I like that you’ve made something a little more bite-sized (and a little less indulgent). Third, and in my mind most importantly, I’m really interested in the bean flour. We’ve made brownies and blondies from whole pureed black beans and chickpeas, but I’ve never done a thing with a bean-based flour. I really, REALLY like the idea, and now I’m getting all kinds of thoughts about how I could use it in other aspects of my cooking. So thanks for posting this, and for doing the healthy fiber-friendly swap! Cool! Thanks, Sean. I really appreciate it. I had done the pureed black bean brownies as well, but I find using the bean flour achieves a truer brownie texture. It’s unbeatable! These look wonderful! If one wanted to use regular flour, would it be a straight swap?